Sorry for the horrible pictures but it’s more just to show the length on me as well as button details for those of you wondering if the quality is the same as the bomber. I’m 5’4 and short legged so I think the length is perfect for me (sorry I don’t have a tape measurer at the moment). The price tag at $228 is totally unfair considering the Everyday Yoga Jacket is $178 and this is pretty much the identical construction. Same inside and same fabric on the outside. Although this is much nicer and dressier so I paid because I’m in need of a jacket. If Lululemon decides to change the price I really hope I get a price adjustment on this. I chose Shark in a size 8. There getting the rest of the colors later on so I’ll have to see if Shark is still my first choice or if I would like Coal better. What do you think of this color?? There is no hood on the jacket but that’s not a deal breaker for me as I always take hoods off. 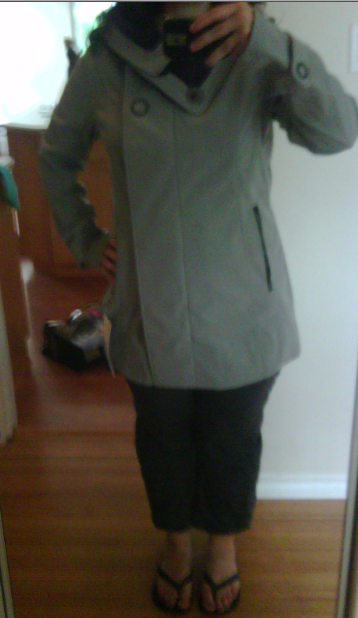 The size I think is perfect for wearing a Stride underneath but I can’t comfortably put a scuba or remix under it. If your a size 2, the range is 4-12 but I think you could pull off the size 4. It bells out a bit more at the bottom in the size up which is pretty too and you would be able to wear a scuba underneath. This jacket is a zip up and button up, double breasted design. The buttons from the collar down are snaps and they seem pretty sturdy. It looks good all the way open if you don’t mind seeing the snaps and it also looks good just with the big chunky buttons done up. You can also flip the collar up to cover your neck. Over all I think this is a perfect jacket for Vancouver as it’s warm (fleece lined like the Everyday Jacket) and water and wind proof. More to post in a little bit. I have a scoop on a few other items. If you returned your vest for this, I was in just after you. I saw this but could not justify the price, but I did return my Insite crops (thought the zippers would be irritating for any mat work) and bought a Gather Racerback in Riverrock so it wasnt a total bust. Are you going to keep the Audrey, Cristina? It is quite a hefty price. What are the other colors? Coal and black? No, I don't have a store in my state. Online only shopper. I like the shark colour – it's a different neutral. I have so much black & coal already. Pairing the shark with lulu bottoms – which tend to be black or coal (mostly) – the shark looks great. I think shark would also look great with jeans. Looks like this jacket could be dressed up or down. If only it were a little cheaper…. It looks great on you. But as Anon 4:16 said, I wish people would protest the high price. That's really over the top. I wonder if they are testing it to see how much people would pay for their merchandise??? As for the color, I would say go with your gut. So, did you stay TTS or is 8 your size down? Also, is shark a light grey? is the lining black? Can you show us more modeling photos please? I am so coveting this jacket but not the price! I want this. Pretty please!! Thanks for posting how the jacket fits you & the picture! $228 is a lot… are prices usually the same in US/Canada? Is this just like a fleece lined rain coat? Or can it be worn in colder temps? I think even if it can be worn through winter, $228 is a lot! I paid a lot less than that for a cute, fitted, Columbia ski jacket… I hope the price comes down! Vicki, I did return the vest. Still feeling unsure though. I want to be able to have both but I just can't. I think I am keeping it although I think I need to try on the charcoal. Feeling very indecisive about the color. Unhappy about the price but I missed out on the Bomber Jackets and always regretted it so I did not want to miss out on this. Coal and Black are the other colors. I was worried that the hip area would be too tight on in the size 8 as that tends to be a big problem for me with jackets. Thought the 10 would be perfect in the hips but big everywhere else. the 8 ended up being the right fit, It flares out slightly so it looks perfect on me in the hips. Anon 3:34 do you have access to a store to try it on? Anon 4:03 I would go with the bigger size then. I tried on a 10 and it was roomy but didn't look at all bad. If I wanted to wear it with a big sweatshirt underneath I would have gotten the 10. Anon 4:13 I'm so torn between the two colors but I think I may stick with the shark. It's different and the coal will not be really special or different. Anon 4:16 thanks. I have no self control and I loved it so I couldn't not get it. I do object to the price though. I think it means I'm only getting one Inspire pullover though. I think right now size 8 is TTS. I'm on the upper end of an 8 so sometimes I go with a 10 but I'm losing weight so If something fits better in a 10 I don't buy it. The 8 is plenty roomy. Just tried it on for the 4th time today and I really do love it. Lots of stretch in the fabric. Size 8 is not a size down for me at this point I think is a fair determination. Sure, i'll do that tomorrow in better light. If I end up with the coal I'll post that one as well. I've decided i'm in love with this jacket. Prices are the same in US/Canada, usually. it's pricey depending on how much use you would get out of it. I would wear this Fall/Winter/Spring comfortably and also dressed up a bit and casually. If you live in a colder climate where you would need to switch to a warmer jacket later on I would say absolutely not to this jacket. Vancouver is pretty mild though so I think I'll be warm enough in this. It's fleece lined and water wind resistant. It's a different look from a ski jacket all together so as far as where you would use it it's a bit more versatile. I have a few Wool coats that are not water resistant at all and are about the same in warmth that cost me $300++ (DKNY, Banana Republic and Aritzia) so it's expensive and I wish it was cheaper but it's not exactly outrageous.